AM-100: AM-100 was awarded to the Flying Tiger Line. Robert Prescott returned to the US in November 1944 and after meeting Los Angeles oil pioneer and magnate, Samuel B. Mosher's associates founded the Flying Tiger Line. The Flying Tiger Line purchased fourteen war surplus Navy Budd Conestoga cargo aircraft and arranged for financial assistance from friends. 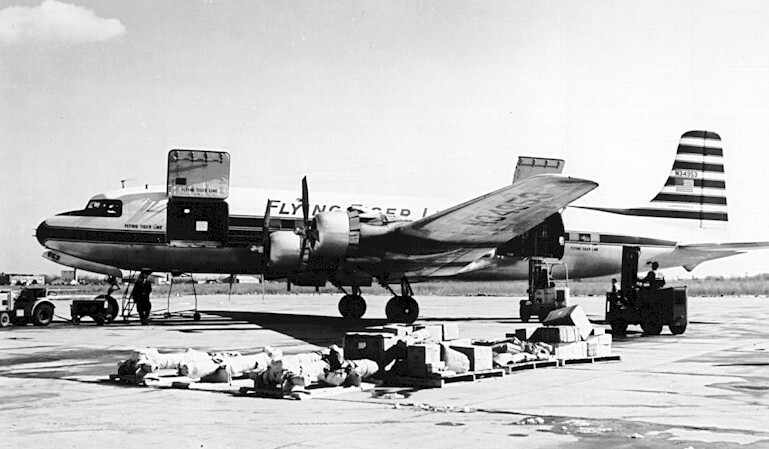 Almost immediately the Flying Tiger Line landed their first three cargo loads -- a planeload of grapes from Bakersfield to Atlanta, flowers from California to Detroit and furniture from New York to California. The Flying Tiger Line was off the ground. AM-100 was awarded to the Flying Tiger Line and on May 28, 1956 it began transcontinental flight service between the east and west coasts of the US.